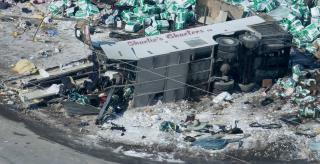 (Newser) – Canadian police say the death toll in a crash between a truck and a bus carrying a hockey team has risen to 15, the AP reports. Police say there were 29 people on the bus, which was carrying the Humboldt Broncos, a team in the Saskatchewan Junior Hockey League The rest of the passengers were taken to the hospital with injuries, some critical. A radio announcer who gave play-by-plays for Broncos games is among those killed. Tyler Bieber worked for the Humboldt station CHBO. A manager with the company that owns the station confirmed in an email to staff that Bieber died in the crash. The deaths of the team's head coach, Darcy Haugan, and 20-year-old captain, Logan Schatz, have also been confirmed by relatives. The driver of the truck that struck the bus carrying the youth hockey team was uninjured. Royal Canadian Mounted Police Assistant Commissioner Curtis Zablocki said he was initially detained but has since been released. He said the driver has been provided with mental health and wellness assistance. Zablocki says the investigation is in its early stages, and it's too early to state a cause. President Trump tweeted condolences Saturday, saying he had spoken with Canadian Prime Minister Justin Trudeau "to pay my highest respect and condolences" to relatives of the team. Trump concluded the tweet saying, "May God be with them all!" The Broncos were on their way to play in Game 5 of a semi-final against the Nipawin Hawks at the time of the crash Friday evening. The driver of that truck is gonna have some 'splainin to do, since his truck is the vehicle that was supposed to yield. What a pointless tragedy. Wow this has been a rough week in Canada, first 20K cases of beer stolen, now a hockey team destroyed. My god what a tragedy. And I bet none of them were wearing seat belts. For some strange reason people think that the laws of gravity don't apply when your riding in a bus a 65mph.